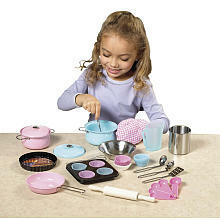 Which are the best Pretend Play Kitchen Toy Sets to Buy? To buy a good kitchen set you first need to decide whether you need a playset which is a kitchen cabinet(like the no.9 and no.10 as below) or just a set of some toy cooking utensils (like no.1,2 and 6 below) or a set of artificial fruits and vegetables(like no.5 below) or some theme based sets like cutting or slicing a pizza (like no.3 below) and cake stand(see no.4 below) or something like tea or coffee sets (like no.7 below). Kitchen cabinet playsets are most expensive as they are big in size and contain everything like cupboards, drawers and shelves to store various kitchen items, sink and tap for water supply, inbuilt gas to cook food and more (like the no.9 and no.10 as below). You can choose to start off with a basic cooking set that contains a set of colorful and attractive utensils, cutlery all made up of high quality plastic. Your kids will love to serve you dinner of mash potatoes which was never so much fun until the product like no.1 below was introduced by a major brand Learning Resources. Melissa& Doug is another much favorable brand in the market that makes provision of easy, simple and great utility based products like no.2 below. Their kitchen accessory set is like most other play sets that have a wooden make in them. In contrast to the colorful multi colored product of Learning Resources like no.1 above, the no.2 below is mostly colored in bright red theme that is bound to set the kids a great attention with the utensils, spatulas and microwave mini gloves. The expensiveness in price of Melissa & Doug product no.2 below is seen as compared to no.1 above due to exceptional quality materials used in design as well as non-toxic and organic paint line finishes. Or else the leading brand of Melissa and Doug is all set to teach your kids about how to make pizzas, slice them in triangular shapes, serve and set the mood right for the absolutely delightful pizza party. The no.3 product is surely there to capture attention amongst your kids as it makes slicing sounds when cut and the entire wooden set is just adorable to be kept in the toy collection of your kids. If you are looking for wooden construction of the kitchen toys pretend and play sets, then Voila manufactured product as no.4 below is another great option for you. This time treat your kids with delicious looking wooden cakes and other treats just like pizzas in no.3 above. It will also teach your kids about benefits of nutrition and healthy eating whereas no.3 above sets the party mood for hogging on pizzas for fun. Just like no.3 product comes with pan for pizzas and slicer, this no.4 product comes with cake stand as accessory. Just in the similar price range as no.3 and no.4 above, there is Casdon brand's 44 pieces play set for kitchen. It is even healthier eating than both above products as it contains assortment of exotic fruits and veggies. Everything is made available miniature in size including the play tins, burgers, slice bread, ketchup bottle and much more. This kicks in an absolute delight to the kids since there are plenty of numbers of accessories available in no.5 product below. If your kid loves to see the quantum of things and be happy and delightful about it rather than just the role play with kitchen stuff, no.5 is a recommended product compared to the ones above. But it all depends upon the taste and liking of the kids, some love pizzas whereas some have fascination towards decorated cakes. We are giving you plenty options with comparisons to enable to make your choices well. We would highlight one more kitchen pretend play set from Casdon brand itself, because of its real world miniature replica. Casdon in association with Morphy Richards, a leading brand of kitchen accessories has launched no.6 product in the market which is bound to set your kids bonkers. Where above three products had more to focus on the things that make up cooking or the outcome of cooking, no.6 product has more to do with accessories that can make cooking experience delight in the kitchen. No.1 and no.2 products merely had to do with only simple cooking utilities, whereas no.6 below is associated to much more even the accessories that run on electricity in real world like the toaster (with pop-up toast), coffee maker etc. No.6 product will introduce your kids to a modern world kitchen for sure. Just like no. 5 product, there is one more smart choice you can make for buying your kids a wholesome quantity of accessories and kitchen related products. The leading brand of Mookie toys is up with their amazing multi colored product in pretend play kitchen accessory set like no.7 product below. Unlike only miniature food items from Casdon like no.5, this below product a fine assortment of food coupled up with an adequate amount of crockery. The material used in this product is entirely plastic in contrast to like no.2 product from Melissa and Doug and it justifies long lasting terms and durability and can also be easily wiped clean with a dampened cloth. In keeping in demands and trends with the current liking of children's products in the market, Casdon has made an attempt to satisfy the needs with product no.8 below which features a hot point electronic cooker. The features are complex and it includes glowing ceramic hobs, grilling and cooking sounds and an illuminated grill plus oven. This product makes as if the real kitchen is brought to life with all facilities to cook, bake and store food. Make sure to browse through this product at your local store if you need to give your kids miniature kitchen with moving knobs and battery operated facilities. This is one of its kind products that have huge dimensions unlike all above products and it runs on 3 x C sized batteries. To counter the above no.8 product, there are various other options like one from the brand of Smoby as product no.9 is below. It features a fully fledged kitchen with compactness implemented in design and loads of accessories for kids to ever get satisfied with. The expensiveness of this product is evident as you might need to spend around three times that of simple pretend play products no.1-no.7, but it is all worth it to tradeoff realty, durability and something much more to learn in a miniature kitchen rather than just a few pieces of utensils, accessories and pretend play food items. You'll be amazed to see the knobs and digital displays on kitchen set that make it look so real! As they say the best one is for the last, if your budget is extraordinarily high to buy a product that stands out from the rest when it comes to realistic design of miniature kitchen, then no.10 product from Plum brand should be a worth buy. The quality of the materials used compared to all others above is much better and it is evident by the fact that FSC certified wood is used for the purpose. The accessories mimic the real world kitchen with appliances like refrigerator, microwave, oven, sink, storage facility etc. The sink is removable for customization which is never the case in products no.8 and no.9 before. The final verdict that is proposed to buy for your kids in kitchen sets pretend play category is of course the no.10 product, but we understand that it might sound insanely expensive to spend on a mere pretend play toy set. Hence our recommendation for fully fledged kitchen set is no.9 product due to its realistic and close to life design. But if you are looking for something much lighter and a kitchen set to be carried on the go, for any picnic spot, garden, etc. then you can choose product no. 5 and no.7.